Learning to speak English is often a challenge, but practicing your speaking skills without worrying too much about any grammatical mistakes you make is the most important thing to remember, especially in the early stages. Arguably, studying English grammar should be a relatively small part of your overall English studies. Yes, it’s important, but concentrating too heavily on studying English grammar can affect your overall progress as there are just so many rules – many of them complex – to remember. Real conversation moves too quickly to remember all the rules and worrying about them can affect your overall confidence and fluency when speaking. than being perfect, when learning to speak English. That said, it’s always good to pick up a few English grammar rules as you progress and a sound knowledge of the rules is particularly important when writing in English. With this in mind, here are 15 simple grammar rules that you can learn quickly and easily by reading the following infographic and testing your understanding by trying the quick quiz that follows. 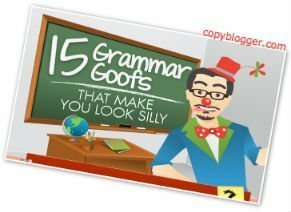 15 Grammar Goofs That Make You Look Silly. The word goof is an informal word meaning mistake. it’s OK to break grammar rules – SOMETIMES. I got only 8 right. This it was good for me thank you. 8 is a pretty good score, Ray. Try again and you’ll do even better.